Unsolved Problems in Biology/How Did It Start? Nobody completely understands how life began. Many people believe that God created life. Many people believe that God created Adam and Eve. They believe that people came from Adam and Eve. Some people believe that life came from molecules. Hundreds of molecules. This is a graphic, not a photo. Some people believe that God created the molecules too. No one knows for sure. Sometimes people disagree about it. Some people believe that life came from evolution, which is something that takes millions and billions of years to happen gradually. This page is about evolution, but it is only one idea. It is not the only idea where life came from. Evolution is a part of science. Evolution is a theory. A theory is a kind of belief about science. Evolution is something that many scientists believe in. The idea of evolution was started by the English man named Charles Darwin in the 1800's. Evolution is a very long story billions of years long. The believers of evolution believe that four billion years ago there were just molecules and no living things. Molecules are not living things. The believers of evolution believe that the molecules combined to gradually form living things over millions and billions of years. They believe that first the molecules combined because of chemistry and became bigger and more complicated molecules. They believe that this kept happening for millions of years until there were thousands of different kinds of molecules. Eventually some special kinds of molecules formed that could make chemical copies of themselves. No one completely understands how this happened. Some of it is known. These special molecules are called DNA and RNA. Another kind of special molecule that formed were called protein molecules. A DNA molecule. This is not a photo. An RNA molecule. This is not a photo. A DNA molecule and protein molecules can combine and look like this. This is not a photo. The DNA molecules and the protein molecules were able to work together because of chemistry and make many different kinds of RNA. The RNA molecules and the protein molecules were able to work together because of chemistry and make many different kinds of proteins, until there were thousands of different kinds of protein molecules. The RNA molecules and the protein molecules were able to work together because of chemistry and make another kind of molecule called lipid molecules. Lipid molecules. The big things are lipid molecules too. This is not a photo. It is a graphic. The lipid molecules came together into microscopic ball shapes called micelles. Micelles are made of lipid molecules. There is a picture below. A micelle. A micelle is made of many lipid molecules. It is round like a ball. Each thing with the long yellow legs is a lipid molecule. Inside the micelles the DNA molecules, the RNA molecules, and the proteins could have protection from being washed away by the ocean water. This way they kept combining and working together because of chemistry, and eventually special proteins formed. These special proteins are called enzymes. Eventually there were thousands of different kinds of enzymes, but no one understands completely how this happened. Some of it is known. Some enzymes could break down sugar molecules. Metal molecules were important. Enzymes and metal molecules worked together. Metal molecules are sometimes called vitamins and minerals. This is a graphic of an enzyme. The orange-brown X in the middle is a metal molecule. This is not a photo. All these different kinds of molecules inside the micelles worked together because of chemistry, until there was a huge amount of work being done inside the micelles. It was very complicated work. When molecules work together, and when they combine to make bigger molecules, that is called a chemical reaction. When the molecules did work, and when there were chemical reactions, the molecules and chemical reactions needed energy. They got energy from sugar and from the sun and from heat. The heat came from the warm water in the oceans and lakes. The micelles and molecules kept getting more and more complicated. Some of the proteins could even move around. After millions of years, another special thing gradually happened. The micelles gradually became bacteria. No one completely understands how this happened, but some of it is known. This is a photo of bacteria. It was taken using a microscope. Bacteria were the first organisms. In other words, they were the first kinds of life. The bacteria could eat sugar because of the proteins. The bacteria could move around because of the proteins. After millions of years, bacteria could move by themselves. The bacteria got bigger from eating. Then it got too big and split in two. When bacteria split in two, they can look like these two round things. This is a photo. The bacteria kept splitting in two until there were millions. This is a graphic, not a real movie. After millions of years the bacteria started to work together to find where to move. This movie took 21 hours to film. It's playing in fast-forward. Bacteria move much slower than this. Later the two bacteria got bigger from eating too. Then they split in two. So then there were four of them. This kept happening until there were billions of them. Many bacteria could work together side by side. They became a group. After millions of years, the group of bacteria could move around together and eat together. So the group of bacteria gradually became an organism. 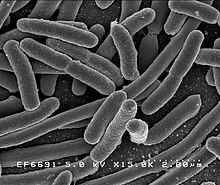 In other words, the group of bacteria gradually became another kind of life called multi-cellular organisms. The groups got bigger and more complicated until they gradually became algae, plants, and microscopic sea creatures. The creatures gradually became animals. After millions of years, the animals started to live on land. Some of the animals gradually became dinosaurs. Some animals gradually became ones with hair called mammals. The dinosaurs died millions of years later, but the mammals lived. Some of the mammals became animals that looked like monkeys. These animals were called primates. 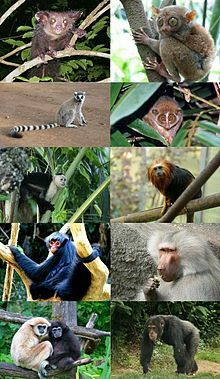 These are all primates. Some are small. Humans are primates too. Primates are a kind of mammal. Millions of years went by, and one kind of the primates became humans. That happened around 200,000 years ago. It took four billion years for all the different kinds of life to appear. This picture shows when each kind appeared. Not everyone believes that this evolution story is true. People study science to find out what is true. Biology is the science about living things. This page was last edited on 21 July 2015, at 13:27.